For millions of people across the country, 7/11/11 was that one glorious day where free slurpees rain down from the heavens and the masses rejoice. For those of us in Jackson, who are 7/11 deprived, Sal & Mookie’s offered solace from the oppressive July sun with a beer dinner. This time Jeff Good & Dan Blumenthal paired their culinary and marketing expertise with Leinenkugel and Blue Moon beers. According to the powerpoint, this beer gets its distinctive flavors from blueberries. I still say that it tastes like fruity pebbles. Light and fruity, it’s a beer made for a summer evening. 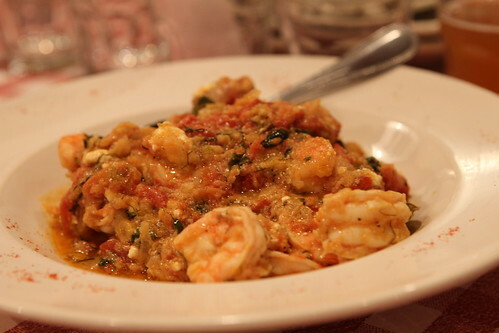 The first course was a baked shrimp with sunset wheat, tomatoes and feta. Well cooked shrimp and feta formed a nice pairing to the Sunset Wheat. 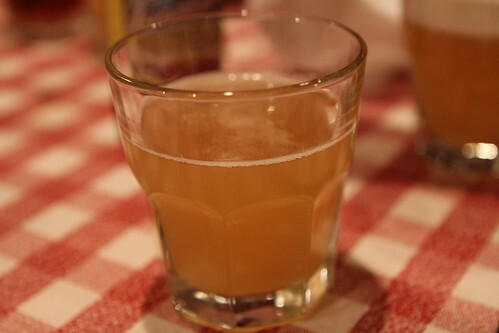 Next was a glass of Blue Moon Honey Wheat. 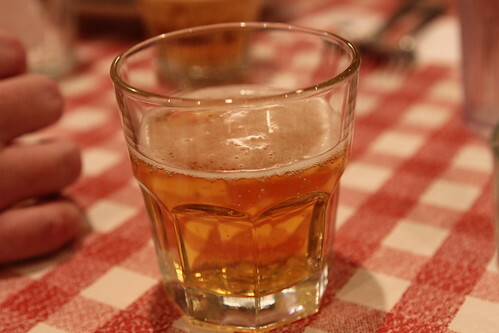 If you like approachable, honey flavored beers, this is right up your alley. 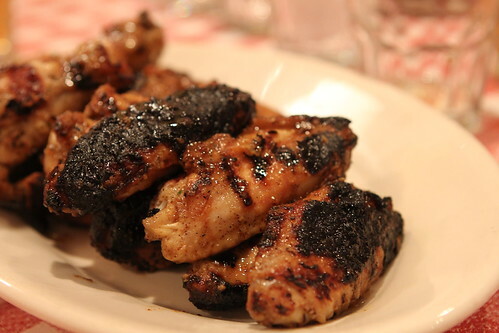 It only makes sense that the Honey Wheat was paired with honey mustard grilled chicken wings. 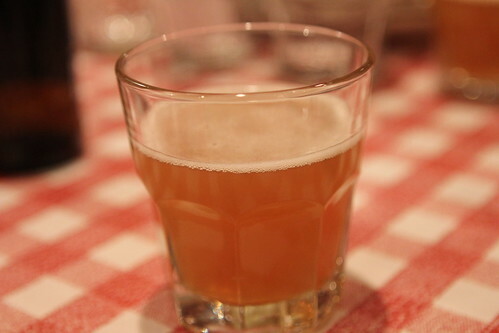 Third for the night was the Blue Moon that everyone knows, the Belgian White. All it needed was a big orange slice. Once again, a Sal & Mookie beer dinner produced an excellent salad. 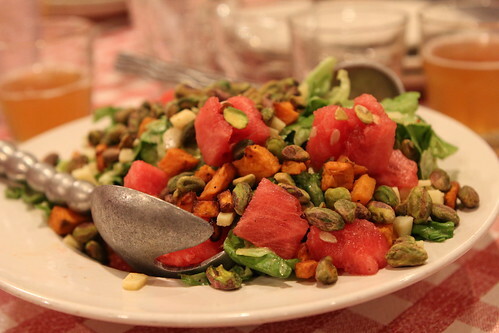 This time it was a salad of butter lettuce, watermelon, roasted sweet potatoes, gruyere, and pistachios in a orange-coriander vinaigrette. 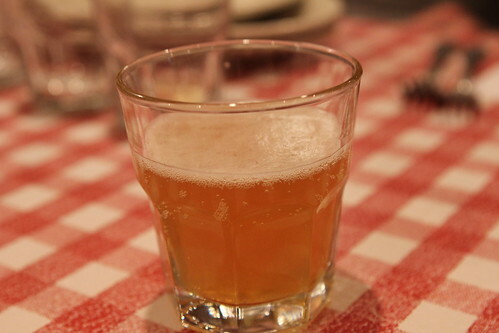 The idea of using the vinaigrette to carry the Belgian White’s orange was brilliant. I just hope that this salad actually appears on a menu instead of being a tease like every other brilliant beer dinner salad. I had no idea that Blue Moon even brewed a pale ale. 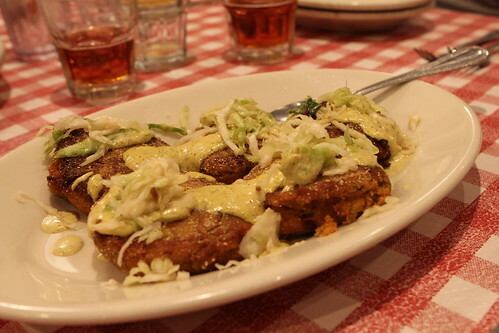 Creole crawfish cakes with sauce remoulade. 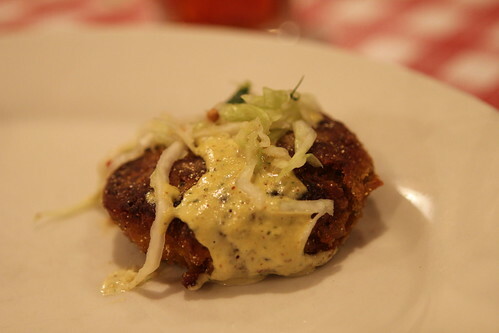 A little spice, a little remoulade, and a lot of crawfish made for a crowd favorite. 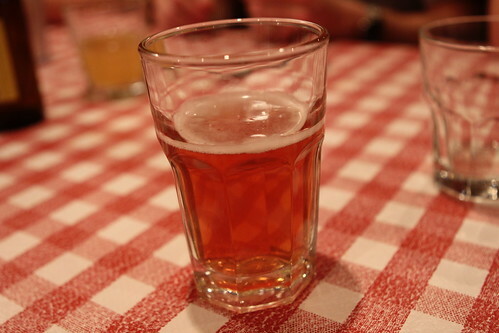 Over the past few years, I’ve had a few disagreements with the next beer, Leinenkugel’s Summer Shandy. If you like beer that's heavy on the lemon, this is right up your alley. 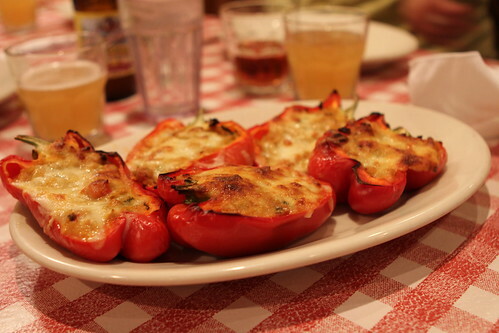 However the North Indian, vegetable stuffed roasted red bell peppers were excellent. The flavors kept us guessing the ingredients and no one complained about another vegetarian dish. 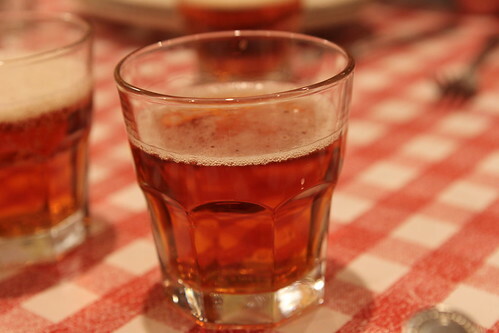 For dessert, we were served a very dessert like beer, Leinenkugel’s Berry Weiss. loganberries, elderberries, and blackberries make for a syrupy sweet beer. 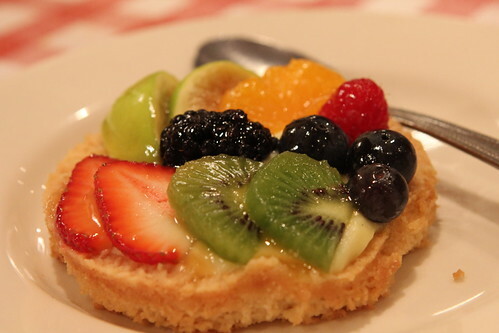 A Summer Fresh Berry Tart with Mascarpone-White Chocolate filling was paired with the Berry Weiss. Topped with blackberries, raspberries, orange segments, strawberries kiwis, grapes, and figs, this was flavor packed dessert. 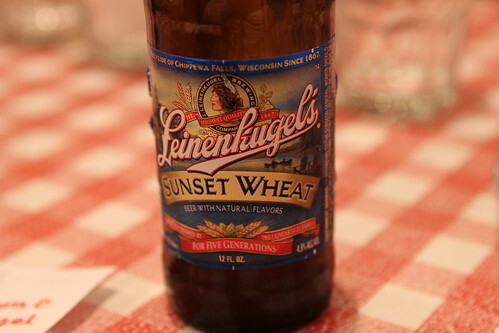 Even though this Leinenkugel & Blue Moon beer dinner was far from my favorite, the fruit heavy beers were a refreshing break from the 100 degree heat. On the whole, it was another quality production from Jeff Good, Dan Blumenthal and company. Now, it’s back to the waiting game for the next beer dinner.